The Trump administration announced a new illegal immigration policy on Thursday, where migrants seeking asylum in the United States must return to Mexico while their claims are processed. 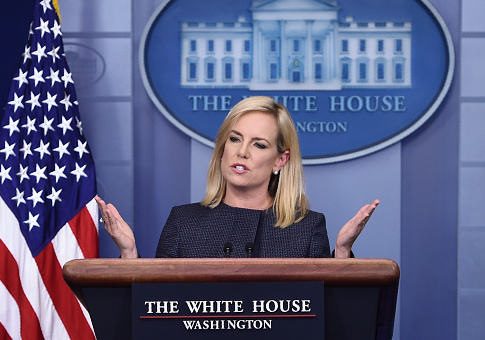 Department of Homeland Security chief Kirstjen Nielsen cited emergency powers under the Immigration and Nationality Act as she revealed the new measures, according to the Washington Post. She told Congress that immigrants entering the country illegally or without proper documentation will go to Mexico "for the duration of their immigration proceedings" and called the policy "historic:"
"They will not be able to disappear into the United States. They will have to wait for approval to come into the United States. If they are granted asylum by a U.S. judge, they will be welcomed into America. If they are not, they will be removed to their home countries," Nielsen said. The United States has been in negotiations with Mexico for weeks to reach such an accord, which had been referred to as "Remain in Mexico," believing that illegal crossings will decline if Central Americans believe the asylum system will no longer offer them a way to avoid deportation. Mexico's Foreign Relations department agreed to the policy and called the move a temporary, humanitarian one. "They will be entitled to equal treatment without any discrimination and with due respect to their human rights, as well as the opportunity to apply for a work permit so they can find paid jobs, which will allow them to meet their basic needs," the department said in a statement. The development comes as President Donald Trump expressed frustration Thursday over not getting adequate funding from Congress in a new spending bill for his long-promised border wall. He also said the "border is tight" and praised the U.S. military and border patrol officials for their work, although the Washington Post noted last month marked the highest number of arrests of migrants crossing the border illegally. This entry was posted in National Security and tagged DHS, Donald Trump, Illegal Immigration, Kirstjen Nielsen, Mexico. Bookmark the permalink.